What does Trump’s recognition of Jerusalem as the capital of Israel mean for the future of Palestine and the Palestinians, and what does it reveal about US policy? Al-Shabaka policy analysts examine these questions and recommend ways for Palestinian civil society and leaders to safeguard Palestinian rights in the face of such a setback. 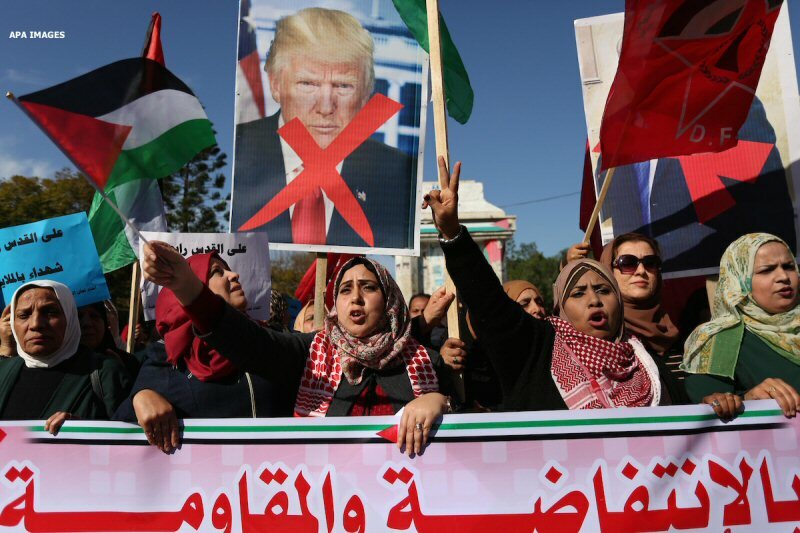 Nur Arafeh argues that Trump’s announcement cements Israel’s apartheid regime and “Judaization” policies in Jerusalem, and calls for the PA to end coordination with Israel and nullify the Oslo Accords. Dana El Kurd makes the case that the US move creates two opposing legal frameworks for Jerusalem, one that follows international law and one that bends to Israeli interests. “[Trump’s declaration] sets a precedent for greater legal recognition in the future,” she writes. “Palestinians should consider new ways of resisting Israeli colonization.” Munir Nuseibah reasons that the development confirms the US as a biased mediator. “The only positive outcome is that it ends the illusion that the ‘peace process’ is legitimate,” he writes. Victor Kattan and Tareq Baconi recommend ways for the PA to respond and move forward. While Kattan outlines a number of strategies for the leadership, including calling on more states to recognize Palestine and devoting more energy to producing a concrete vision of the state it wants to establish, Baconi calls for the PA to be restructured to support a redirection of the Palestinian struggle – but in such a way that would mitigate the economic detriment of its collapse. Trump’s announcement cements Israel’s apartheid regime and “Judaization” policies in Jerusalem, and accelerates its dispossession of Palestinians. Since the occupation began in 1967, Israel has been committed to transforming Jerusalem from a multi-religious and multi-cultural city into a “reunified” Jewish city under its exclusive control. It has accelerated the Judaization of the city through policies that affect its geographical and physical landscape and that are meant to stem the “demographic threat” posed by Palestinians. Policies have included the construction of the Wall in 2002; the revocation of the residency of Palestinian Jerusalemites under the pretext of “breach of allegiance;” restrictions on family unification; discriminatory urban and zoning policies; and the closure of major Palestinian institutions in East Jerusalem. A deliberately engineered economic collapse of East Jerusalem has accompanied these policies, as exemplified by the deterioration of the tourism sector and the recession of commercial markets in the Old City. By recognizing Jerusalem as the capital of Israel, the US administration is therefore offering the Israeli government carte blanche for its Judaization through the expansion of illegal Israeli settlements and an intensification of Israeli annexation measures and discriminatory policies against the Palestinian people. Indeed, following Trump’s announcement, Israeli Housing Minister Yoav Galant announced a plan to build 14,000 new settlement units in occupied Jerusalem. Furthermore, Trump’s announcement encourages more incursions of right-wing Israeli Jews into the Al-Aqsa compound – incursions that have been provoking clashes with Palestinians. These are likely to trigger widespread violence and bloodshed, just as in 2000, when Ariel Sharon’s provocative visit to the compound led to the Second Intifada. Moreover, any threat to Al-Aqsa – which Israeli extremists want transferred to Mecca in order to build a temple on the site – would ignite major eruptions in the Arab and Muslim world. This would cause the religious polarization of what has historically been a political conflict, rooted in the forced dispossession, displacement, ethnic cleansing, and economic marginalization of Palestinians. The US has never been an honest mediator on the issue of Palestine, and its recognition of Jerusalem as Israel’s capital only confirms that fact. The US move will have profound effects in terms of the legal precedent it sets, as well as on the lives of Palestinians living under occupation. Trump’s announcement creates two opposing legal frameworks on the question of Jerusalem – or, at least, this is what Israel will argue. International law has not changed, and the vast majority of the world has expressed commitment to the idea of a shared capital. Nevertheless, when the world superpower that sits on the UN Security Council and controls military bases all over the globe decides unilaterally that one party to the conflict has ownership of disputed territory, this sets a precedent for greater legal recognition in the future. Research has shown that despite the veneer of multilateralism, the US can exert a great deal of influence on the positions and policies of international organizations. The current consensus in the UN around the Jerusalem issue is therefore not enough: If the US has decided on a position, we can expect its allies to follow suit and use the American decision as justification. The declaration will also provide even greater legal cover for continued Israeli colonization in the remaining Palestinian areas of Jerusalem. In addition to the theft of Palestinian land in West Jerusalem in 1948, Israel has been adept at growing settlements – such as Ma’ale Adumim and Pisgat Ze’ev – in the heart of East Jerusalem. Israel has also used the Wall to cut Palestinian neighborhoods, such as Abu Dis, out of the official municipality of Jerusalem. The residents of the remaining areas of Palestinian Jerusalem live in economic hardship, paying taxes to the Israeli government for services they never receive. They are also always at risk of home demolitions or evictions in the dead of night by settlers accompanied by armed soldiers. Trump’s move comes at a time of severe polarization among Arab governments – a moment the US administration and its Israeli handlers recognized and took advantage of. They have also taken advantage of the fact that a number of Arab regimes have aligned themselves with the Trump-Kushner camp in American politics, even though the Trump administration and family are under investigation and are growing increasingly unpopular among Americans. Moreover, the move occurred despite the fact that an overwhelming majority (88%) of Arabs consider the Palestinian cause personally important to them – so much so that protests have erupted from Tunisia to Qatar. But as usual, autocratic Arab regimes seem to think that short-term repression will win out against the desires and loyalties of their citizens. In response to this unprecedented level of US hubris and Arab regime collusion, Palestinians should be ready and willing to consider new ways of resisting Israeli colonization. This should include a serious assessment of whether the two-state paradigm imposed by the Oslo Accords is finally over. Trump’s recognition of Jerusalem as Israel’s capital sends the message that no matter how much Israel violates international law, such violations only need time to be recognized. Israel has been colonizing the western part of Jerusalem since 1948 and its eastern part since 1967, all the while displacing the native Palestinian population to increase the percentage of Jewish residents. These policies have been in violation of international law, and the international community has consistently refrained from recognizing their legitimacy. Trump’s breach of this consensus is a dangerous precedent that promotes Israel’s assumption that might makes right. Following Trump’s speech, Palestinian President Mahmoud Abbas declared that the US is no longer a trusted mediator for the “peace process.” Yet Trump’s move simply confirms what was already known: The US is not a neutral mediator, and this is one of the main reasons for the failure of the peace process. Even Obama, who appeared to want to apply some pressure to Israel to stop building settlements in the West Bank, failed to do so due to Israel’s immense power in US political and media circles. Trump is therefore not the only problem. The only positive outcome of Trump’s move is that it ends the illusion that the “peace process” is legitimate. It forces the PLO to rethink the entire Palestinian cause, including the viability of the two-state solution. Yet the PLO does not seem to have a strategic alternative to the status quo. Palestinian civil society will need to take on an even larger role to advocate for Palestinian rights locally, regionally, and internationally. Yet it is futile for Arab states or international organizations to issue resolutions calling on the US to reverse its position. Trump is not going to undo his statement. While grandstanding will buy the PA a few days or weeks, people will want to see results. Virtually no Arab government has summoned a US ambassador or charge d’affaires to protest the decision. President Abbas has said that Palestine will “transfer the entire file of the conflict to the United Nations,” but it is difficult to see what the UN can do. So long as there is no pressure on Israel, little will change. Despite President Erdogan’s bold speech at the OIC, Turkey is doing little to help the Palestinians in practice. Instead of suspending diplomatic relations with Israel as Erdogan said he would do, Ankara is forging closer relations with Tel Aviv. So are many Arab states. The PA needs to adopt a more sophisticated approach. It must make it clear that recognition of Jerusalem as the shared capital of a Palestinian state at peace with Israel is the bar for any future engagement with the US. The Palestinian leadership should call on more states to recognize Palestine, especially those in Europe sitting on the fence. The PA should make it clear to the EU that it is not satisfied with the same statements being issued year after year. The EU should consider issuing a similar statement to Trump saying that the EU recognizes Jerusalem as the capital of Palestine, but that this recognition does not affect the final status of Jerusalem, boundaries, or holy sites. Since the EU is unlikely to agree to this at the council level, the PA should encourage individual European states to break ranks and recognize Palestine as Iceland, Sweden, and the Vatican have done. The PA should form a taskforce, identify those states that would be favorable to such an initiative, and reach out to them. The PA could also consider asking states with consulates general in East Jerusalem to upgrade them to embassies to the state of Palestine. Sweden, Turkey, and the Vatican have already done so. The PA should ask Belgium, France, Italy, Spain, and the UK to do the same. The PA should also ask the Trump administration what it plans to do with the US consulate general in Jerusalem. To prevent Israel from downgrading the status of the consulates general, Belgium, France, Italy, Spain, and the UK can dangle the carrot of recognition of West Jerusalem as Israel’s capital and East Jerusalem as the capital of a Palestinian state, just like Russia did earlier this year. Additionally, the EU could condition moving its other member states’ embassies from Tel Aviv to Jerusalem on a complete cessation of Israeli settlement activity. The PA should channel more of its energy into producing a concrete Palestinian vision of the state it wants to establish in East Jerusalem, the West Bank, and the Gaza Strip, and communicate this clearly and effectively to the world. The best way to do this would be for the Palestinian leadership to publish an updated blueprint of the two-state solution that should go beyond the Arab Peace Initiative (API) that could then form the basis for constructive talks with Israel. Involving Arab states in peace talks with Israel is not necessarily a bad strategy, but the PA needs to make it clear what its bottom line is and what it is prepared to negotiate over. The PA must take the initiative in leading these talks and not let other Arab states come up with peace proposals of their own for the Palestinians. These states do not have the expertise or knowledge that Palestinians have of their own situation. When passions have subsided, the PA will still find that it will have to deal with the US, with Israel, and with the fact that Jerusalem remains under Israeli occupation. The PA must continue to make clear that the Israel-Palestine dispute is not a religious issue. It should engage Christian, Jewish, and Muslim religious leaders to send a clear message to the US that Jerusalem is sacred to all religions and that the Palestinians do not desire to see further unrest. The PA must ensure that the protests taking place in the West Bank remain peaceful, and Hamas must stop firing rockets into Israel. Palestinians in Jerusalem must remain steadfast and make their voices heard. Palestinian activists should give voice to community leaders and church leaders, and engage with the media. Security cooperation with Israel should continue, but it should be made clear to those states that fund the Palestinian security services that this cooperation will become more difficult if they do not recognize a Palestinian state with its capital in Jerusalem. Trump’s recognition of Jerusalem as Israel’s capital has made the future of the Palestinian Authority more uncertain than ever. There is a strong case to be made that the current Palestinian leadership must resign, and that the PA must be dismantled, given that it has actively sustained the charade that limited self-rule coupled with negotiations might lead to liberation and statehood. However, the PA offers a crucial safety net for Palestinians under occupation, and its collapse would have a significant impact on those whose livelihood depend on it. Therefore, members of civil society as well as Palestinian leaders must begin measures to restructure the PA in a manner that would mitigate the economic detriment of its collapse while ensuring that it does not continue operating as a subcontractor to Israel’s occupation. A number of immediate measures must be taken. First, security coordination must end. Rather than cracking down on acts of civil disobedience and measures of resistance, the PA must enable and empower such actions along clear guidelines that are formulated in a representative manner. More importantly, the PA must be reconfigured to support a redirection of the Palestinian struggle. The PLO should lead this, and it must move away from negotiations and toward a rights-based anti-apartheid struggle. Palestinian activists, leaders, and members of civil society should spearhead this redirection in several ways. These include strengthening alliances aimed at enhancing international solidarity for the Palestinian struggle, expanding and empowering the growth of a global boycott movement, pushing forward measures at the International Criminal Court, and utilizing the tools that had been secured (and paradoxically shelved) in international arenas, including the UN, to increase pressure on members of the international community to hold Israel accountable for its violations of international law. While likely to face the greatest brunt of the ensuing backlash, Palestinians within the occupied territories must sustain acts of civil disobedience against their political leaders in the West Bank, including East Jerusalem, and the Gaza Strip for failing to effectively reconcile and pursue the reform of the PLO, as well as against the occupation. In the regional diaspora, the Palestinian community must mobilize against Arab regimes who are more empowered than ever to collude with Israel and the Trump administration. In the US and the UK, the Palestinian diaspora must continue to make strides toward empowering the international solidarity movement while strategically developing the power of the Palestinian grassroots movement to advance a rights-based struggle.